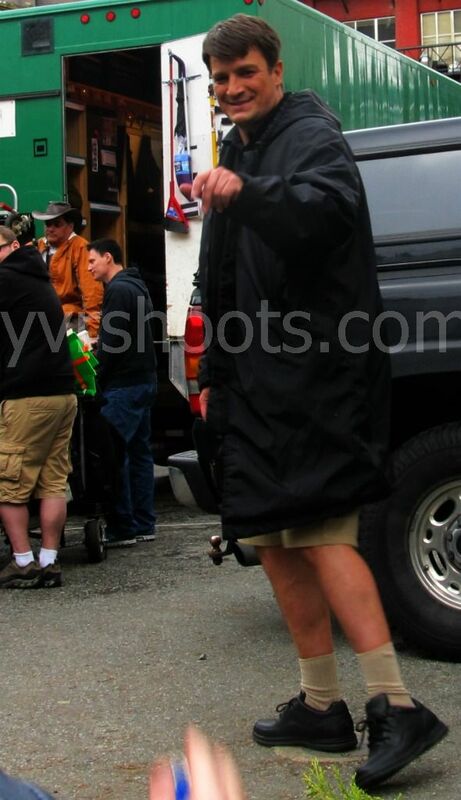 Whoever thought of making Nathan Fillion’s god Hermes a UPS courier in shorts is brilliant. What a great twist on the idea of Hermes, the messenger of the Gods, giving Percy Jackson what he needs to head into the Sea of Monsters to find the mythical golden fleece to save Camp Half-Blood from attack by monsters, the second in the Percy Jackson & the Olympians franchise. 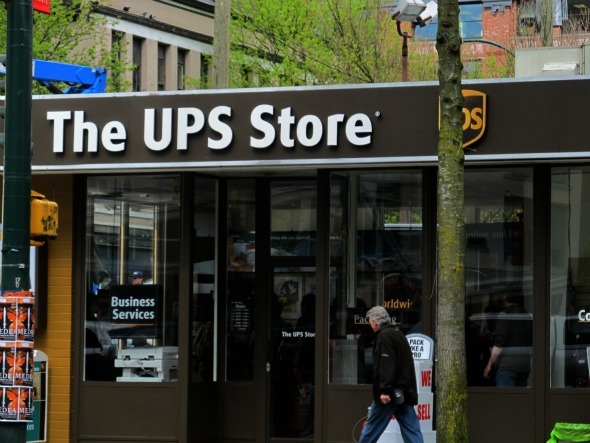 Nathan Fillion flew into Vancouver yesterday to do his cameo but he wasn’t easy to spot inside a fake UPS Store at Pender & Abbott in downtown Vancouver. He may have gone undetected if a friend hadn’t suggested he could be inside behind the counter. And sure enough from across the street through the glass I caught glimpses of him laughing with the main cast – Logan Lerman”s Percy Jackson; Douglas Smith’s Tyson and Alexandra Daddario’s Annabeth. And then in between setups I saw Nathan Fillion exit out the back and spotted the bare legs. I’d hoped for those short brown shorts but these are more than fine and he wore them well. Don’t you agree? A couple of fans got his attention earlier in the day yelling, “Hey Captain Tightpants!” And here he is signing another fan’s Firefly DVD and returning her blue sharpee. Nice Canadian boy that he is despite all his success. UPDATE: On his second day as the god Hermes, Nathan Fillion filmed in Burnaby Fraser Foreshore Park dressed in a sharp suit with slicked-back hair not as a UPS courier in shorts. He cocked an eyebrow, looking devilish, in a photo with one lucky fan who works in the area. And that was a wrap for his cameo on Percy Jackson 2. Short but sweet for the many Fillion fans. Nice pics of Mr. Fillion! He sure didn’t get much of a break between Castle and this! Nice job with the report… and noticing Mr. Fillion on the set. Oh Captain my Captain! Nice legs. Now why coyldnt he have dropped by for Vancouvet’s 1st Fan Expo last weekend? I would have lined up at his table.